This week’s Then & Now comes courtesy of prolific local historian Robin Leach, whose recent research on Kenilworth’s involvement with animal skin processing, in particular on two major sites in the town centre and at Mill End, will soon be available in his new book Kenilworth People and Places, Volume 3 (Rookfield Publications, 2018) which is due to hit the shelves of Kenilworth Books today. Kenilworth’s tannery was for a century and a half the most prominent of the town’s industries. 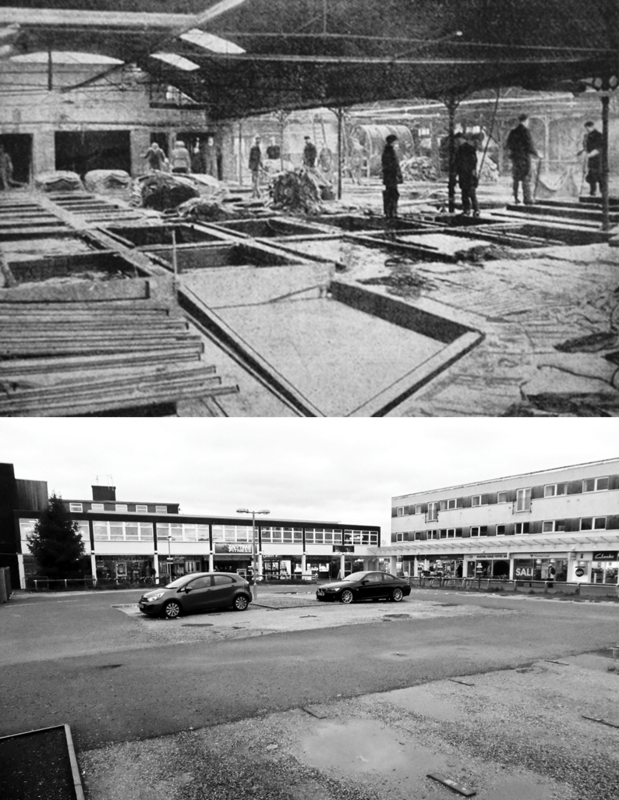 Started in the town centre in the early 19th century, it closed in 1961 and was demolished to make way for Talisman Square, seen at the time as the start of a bright new modern town centre. After the tannery had been bankrupt and closed twice, it was taken over in 1888 by Samuel Barrow Snr; in 1902 he appointed Charles Randall as the new Managing Director, moving him from another Barrow tannery, in Grange Road, Bermondsey. Randall set about rebuilding much of the works, including providing electric light, amongst the first in the town, 20 years before mains electricity was available. Randall also of course was to have a positive impact on town affairs. The ‘Then’ photograph was taken in 1908, looking across some of the 200 or so pits that were scattered across the site at that time, covered with a corrugated iron roof supported on iron pillars. It is possible that these particular pits were amongst the first on the site and they certainly survived until the tannery’s closure; this is a scene that hardly changed for 150 years throughout the tannery’s existence. The ‘Now’ view (3rd January 2018) is very approximate as it has not been possible to identify with absolute certainty the precise location of the ‘then’ photograph, but it is somewhere in the same area. Three large trenches were dug across the car park in February 2018 to investigate the archaeology prior to impending building work. Robin’s new book, Kenilworth People and Places, Volume 3 includes the complete history of the tannery, from its 18th century origins up to some tannery remains being uncovered in February 2018, and of the oft-overlooked on-site associated firm of J F Ward & Co, Curriers, who supplied coloured leather to Coventry’s car industry. The book includes a number of other previously unpublished pre-WW1 photographs of Kenilworth’s tannery and curriers at work.